What Is SmartLine and What Advantages Does It Offer? If you have ever stepped into a busy restaurant and seen unhappy people pushing towards the hostess, and others looking unhappily around from their tables at rushed looking waiters, you know that technology has a lot to offer a restaurant. Imagine a restaurant that runs swiftly and silently thanks to the smart line app. The only noise you should hear is satisfied guests and their companions enjoying a meal with their family and friends, not confused hostesses looking for tired and cranky members of a party that should have been placed at a table half an hour ago. When customers approach the hostess at a restaurant equipped with SmartLine, if there is a wait, they will have the option to wait in the restaurant or be alerted by text message. No more jostling around in a crowded waiting area, or in the bar waiting for a table. Your guests will be free to wander the sidewalks if they like, by checking into a mobile waiting list. They will easily be able to see what their place in line is and how long they have been waiting. When the table is ready for the guests, they will receive a text message. Gone are the annoying buzzers and loud announcements. In case of internet loss, the wait list can still be managed without internet access, so it’s worry free. Meanwhile, what is happening behind the scenes of the restaurant is just as important. The SmartLine manager is able to see who is being seated; control customer wait times, review guest ticket times, and staff professionalism as well as monitor table turn over to maximize profits. Additionally, the staff is able to communicate discreetly regarding special requests for guests as necessary via the hand-held devices. Any issue or accommodation can be handled immediately and without calling any attention to it. 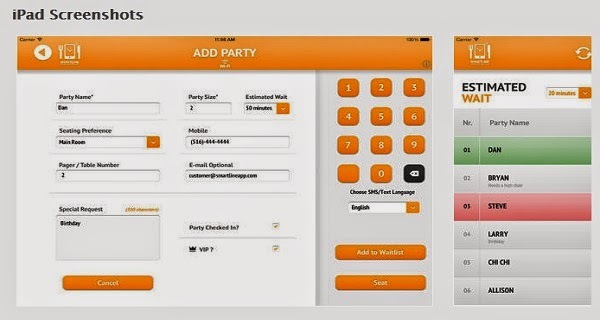 Parties and specific areas such as the main dining room, bar, VIP area are color coded by device for identification. At the end of the night, when the checks are being settled, it costs the restaurant less on the bottom line, too. The hostess will find she has been interrupted less, since guests can remove their names from the lists remotely from the app. Since the app replaces the need for pagers and printers, the app saves the expense and adds to the restaurant’s profit. Finally, and most importantly, the restaurant has served a lot more customers than usual by turning a lot more tables at the end of the night because the restaurant has run much more efficiently. No tables sitting empty, and no time wasted finding someone to fill them. Happy customers, happy management, happy restaurant.